Busy bridges throughout Connecticut might need to be closed because the federal government considers them structurally deficient, and the state says they don’t have enough money to maintain and repair them. The United States Federal Highway Administration has classified hundreds of Connecticut bridges, including the Interstate 84 overpass in Hartford and the Yankee Doodle bridge in Fairfield, as structurally deficient. None of these bridges are currently considered unsafe for cars according to the state’s Department of Transportation (DOT), but the department could be forced to close them if costly repairs aren’t made soon and their conditions worsen. One such bridge along Interstate 95 that crosses railroad tracks in West Haven sees an average of 138,000 crossings per day. Christine Abboud, whose business neighbors the bridge, said her employees, who often pass beneath it, told her they’ve seen things falling off. She said she has seen the bridge shake and worries that worries heavy traffic on the bridge may be taking a toll. Farther down Route 1, the deck of the historic Washington drawbridge that connects Milford to Stratford has badly pitted concrete and exposed steel. 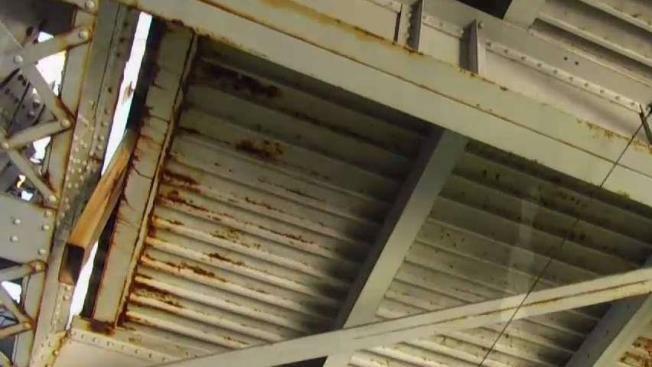 Bridge inspectors noted areas of "up to 100% deterioration," according to its most recent inspection report the NBC Connecticut Troubleshooters obtained from the DOT. More than 50 miles away in East Haddam, the Troubleshooters spotted corrosion along the floorboards of the aging metal swing bridge, including holes along the lengths of several support beams where the steel rusted through. The Sigourney Street Bridge in Hartford which crosses over Capitol Avenue and goes under I-84 is a popular route for commuters, and cars pass over it more than 10,000 times a day. With the aid of DroneRanger, the Troubleshooters were able to follow the same route, but from underneath the deck, and found exposed rebar, long cracks, holes in the concrete, and more rust. Travis Woodward, a project engineer with the Department of Transportation and president of the union representing other DOT public employees, told the Troubleshooters that bridges in this condition need to be repaired. "As soon as the rot and the deterioration get down to rebar, it becomes a problem because now the skeleton of the structure is falling apart," Woodward said. However, the Troubleshooters learned that repairs for many of the state's structurally deficient bridges have been canceled or postponed. Earlier this year, Gov. Dannel Malloy eliminated $4.3 billion worth of transportation projects, citing serious funding issues for the state's Special Transportation Fund. Nearly $200 million-worth of already scheduled repairs on 32 structurally deficient bridges were caught up in the mix. Woodward believes there would be more money for bridge repairs if the state ended its decades-long practice of contracting with outside consultants instead of using state employees for construction and inspection services. A union analysis found nearly $150 million could have been saved in 2015 and 2016 if that work was done in-house at the DOT. "That's money we could be spending on fixing our bridges," Woodward said. Transportation Commissioner Jim Redeker said he does not believe the savings would be quite so substantial, but agreed the amount is significant. However, he said he cannot capitalize on those savings without additional funds to first make new hires. "Right now we don't have the funding to do the bridges, or to hire the inspectors," explained Redeker. DOT relies completely on the state's Special Transportation Fund for its budget and right now there are massive deficits. Redeker said Connecticut's roads and bridges, "will continue to see deterioration happen very quickly," without additional funding. If a bridge becomes too fragile, Redeker said the DOT will have no choice but to close it off to traffic. "Closing a bridge that happens to be a critical connection someplace in Connecticut that should not happen, it's too important," Redeker said. He added an immediate influx of cash would be needed to help stop the overall number of structurally deficient bridges from rising. In the meantime, Redeker said driving over the bridges is safe. Professor Michael Chajes, an expert on evaluating bridges at the University of Delaware's Bridge Research Lab, agrees that these bridges are unlikely to pose an immediate risk to the public. According to Chajes, structurally deficient bridges are in poor condition and need to be closely monitored, but, "they're not necessarily bridges that are unsafe or ready to fall down." However, he said putting off repairs comes at a cost. "The longer you wait, the more money you will spend to eventually repair or replace the bridge," Chajes said. Abboud is worried that a bridge closure could prove costly for her business and the community. She noted there would be, "so many people that aren't going to be able to get through from New Haven to West Haven." Finding new sources of revenue for the Special Transportation Fund has revived debate at the state Capitol over higher gas taxes and highway tolls. Redeker said tolls may be a good idea for the future benefit of the fund, but would not be a fast enough solution for the funds' immediate needs. For a list of all the state's structurally deficient bridges and a map of the 32 bridges with canceled repairs, click here.